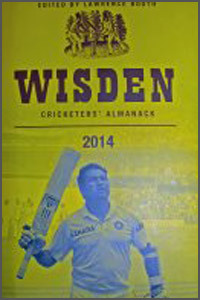 It says much for the recently-retired Sachin Tendulkar that he should appear on the covers of both the 151st edition of Wisden and also the Wisden India edition. It is fitting that the Cricketers’ Bible should have fulsome coverage of this extraordinary cricketer and man. Indeed, one article simply entitled Sachin, the bringer of joy conveys what Tendulkar has brought to the cricketing world in over two generations of playing the game. As can be expected of the venerable Almanack there is so much of interest once again within its 1584 pages. The Five Cricketers of the Year are Shikhar Dhawan, who launched his Test career in memorable and remarkable fashion and who has made an impact in shorter versions; Joe Root, Chris Rogers and Ryan Harris, all of whom had such an effect in the back-to-back Ashes series and a second lady cricketer, Charlotte Edwards, who has done so much to make the England side so successful. It is good to see a further chapter devoted to five champion lady cricketers whose Test matches started almost eighty years ago. The Leading Cricketer in the World is the deserving Dale Steyn. There are some interesting articles. Ten people, ranging from umpires to spectators, discuss the DRS system giving a balanced view of this at times confusing and always hotly-debated subject. Neville Scott has written a fascinating review of the Friends Life T20 season with some deep observations. Love or loathe this format, I did wonder at the scorecards from the Finals Day where dismissals are recorded by numbers from 1 to 11 – presumably as they appear in batting order – so, in the final won so well by Northamptonshire over Surrey to give them their first silverware in twenty-one years, you might wonder how Surrey’s top-scorer, Glenn Maxwell, had his innings ended as it merely states c 9 b 5... Thank goodness for those not out and run out! I was also delighted to see a very small snippet on page 291 denoting The Laxman Effect. Ever since the elegant Hyderabadi responded to his side’s being asked to follow on at Eden Gardens in 2000-01 and responded with not only more runs from his own bat than the follow-on figure resulting in a famous Indian victory, sides have appeared more reluctant to enforce the follow-on. Rahul Dravid’s performance during the same Test should not be underestimated. Once again, the Wisden – MCC Photograph of the Year gives budding photographers the chance to shine. This year’s, fittingly, is a photograph by Atul Kamble of Tendulkar resuming his final Test innings at the Wankhede Stadium. Needless to say, the quality of all photographs used within the Almanack is exemplary. As can also be expected, the coverage of the conflicting fortunes for both England and Australia in the back-to-back series is very good. The Records Section is another remarkable effort headed by Philip Bailey. For this year, those who have or are serving bans for corruption are included and those players are mentioned in the notes section. Like a database I use, these players can be either included or excluded according to one’s preference in the same way that the database allows the user to include or exclude certain matches played for charity or which were deemed to be international matches played with composite players from many countries. It is the reader’s and user’s preference what to use. As always, the 151st edition of Wisden is a must-have and a necessary book for all the in-depth details of cricket played worldwide. Worldwide it certainly is too with coverage including the fortunes of Vatican City and Nuaru and many others.